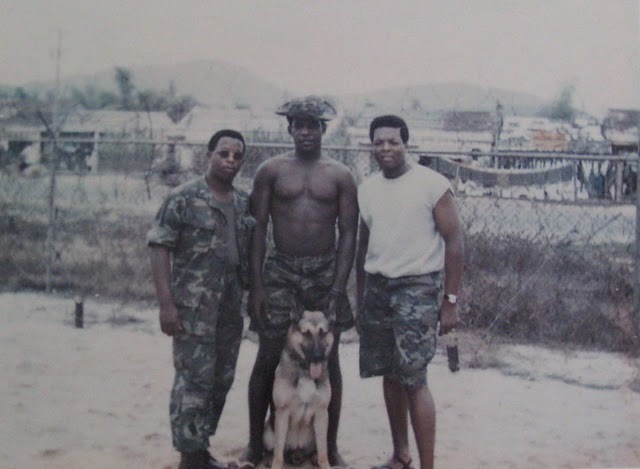 Cpl Joe Taylor, center, and two of his buddies in Vietnam with a bomb-sniffing police dog. Taylor served with Delta Company, 1st Battalion, 26th Marine Regiment, 4th Marine Division in the 1960s. Photo provided. “Why were we there? What did we accomplish?” he asks himself 40 years later. The 63-year-old Marine Corps sergeant from Cape Coral, Fla. has no answers to these questions. What he can tell you is how he felt being an 18-year-old Marine fighting in a strange land a long way from home four decades ago. His unit: Delta Company, 1st Battalion, 26th Marine Regiment, 4th Marine Division was the first Marine unit to arrive in Vietnam by ship. It was 1966 when they reached De Nang. They were flown by helicopter to the war zone whenever the fighting got difficult, more troops were needed and back to the ship after the shooting was over. “When they fed you steak and eggs for breakfast you knew you were going into a hot combat zone that morning. You’d better look around you because the person in front of you or in back of you might not be there when you returned,” Taylor said. After their battalion reached Red Beach in De Nang Charlie and Delta Companies were sent to Hill 55, about 20 miles outside De Nang. Their job: Hold the hill at all costs. “The second night we were there we were overrun by NVA (North Vietnamese Army) regulars and VC (Vietcong) guerrillas. They were coming at us in human waves,” Taylor said. “We had strung concertina wire around our camp and added Claymore mines facing toward the enemy and Bouncing Betty mines in the wire. Nothing stopped them because they were all hopped up on drugs. “We had an LP (Listing Post) outside the wire manned by a couple of Marines. They fell asleep and Charlie snuck in and slit their throats. Then they walked right in on top of us,” he said. Taylor’s squad was out in the bush that night searching for the enemy. What they found was much more than they bargained for. “We heard all this commotion up on the hill in back of us. Our guys were getting over-run, so they called in the artillery and a ‘Puff the Magic Dragon’ gun ship armed with a gating gun,” Taylor said. “Because of all our fire power Charlie had to retreat and when he did he retreated right over top of our squad out in he bush. “A ‘gook’ landed right on me with his AK-47 rifle pointed at me. I was shocked and so was he. I was fortunate, I got my M-16 rounds off and killed him before he killed me,” the Leatherneck said. They were only 500 yards away from their hill-top fire base, but it could have been 1,000 miles. Taylor’s patrol had to cut down everything in front of it blocking their way back to base until they reached the concertina wire around the hill’s perimeter. Then with extra caution they give the password so they weren’t mistaken by Marines on Hill 55 for attacking NVA or VC troops. “We lost half our patrol, six or seven men didn’t make it. They were killed or wounded,” he recalled. 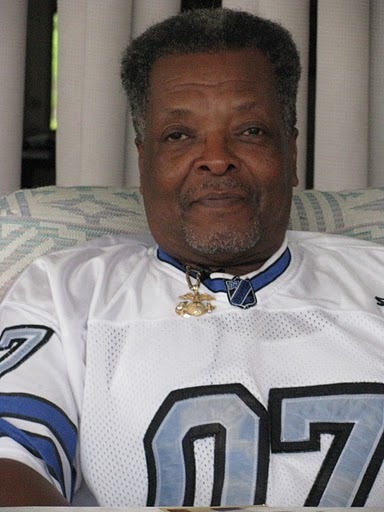 There was a time, early on in his first tour of Vietnam when enemy soldiers were not shooting black U.S. Marines. From then on black grunts were just as fair game as white grunts as far as the NVA and VC were concerned. Eventually Taylor and his company were relocated from Hill 55, outside Da Nang, down to the south near “The Gates of Hell.” This was a jungle area close to the Delta that cost the lives of many young American servicemen. 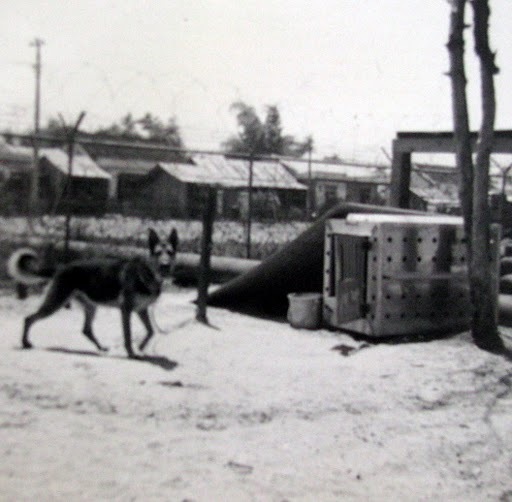 Bomb-sniffing dogs like this German Shepard saved many Marines’ lives during the Vietnam War. Photo provided. 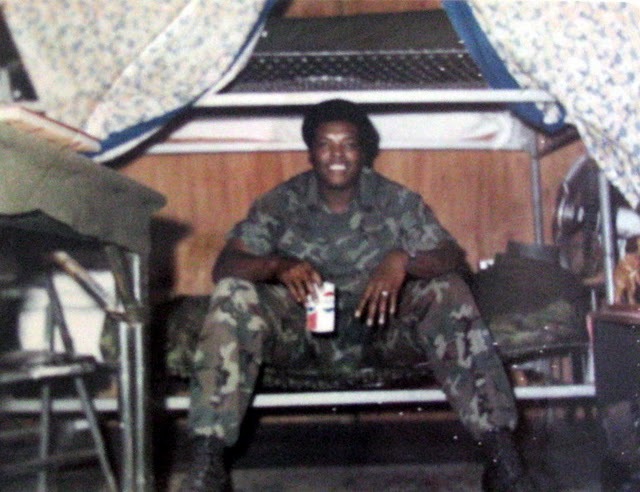 After a year on the front lines in Vietnam, he was given a week’s vacation in Thailand before being sent back to the States to complete his tour of duty. It was during this period Taylor was stationed at the Marine Corps Barracks in Washington, D.C.
“It was a spit and polished outfit that I didn’t like much. So I volunteered for a second tour of duty in Vietnam to get away from the spit and polish,” he said. Tet was a coordinated attack by tens of thousands of NVA and VC soldiers on at least 100 cities and bases throughout South Vietnam. When it was over, the NVA and VC had lost upwards of 75,000 soldiers. They sustained big losses on the battlefield while American forces appeared victorious. However, it was an even bigger setback for the U.S. It became evident to many Americans the Vietnam War was not a winnable fight. The public demanded President Lyndon Johnson get our forces out of there. By 1973 the war was over and we had lost. When Taylor came back from Vietnam after his second tour he was still in the Marines stationed at the Philadelphia Navy Yard. Out on the town in civilian clothes one night he got drunk and took on a couple of “Philly’s Finest” and a police dog. He woke up in the clink. “My commander had to come down and bail me out. When I showed up in court I was wearing my Marine uniform and my commander was standing beside me,” Taylor recalled. “The judge dropped all the charges against me. He only charged me $2.50, court costs. The sergeant ended up in the rear echelon in Saigon. He had a good time his last year in Vietnam. He wasn’t ducking bullets in the bush. Taylor left the country the last time in 1970. When he returned to the U.S. the battle-hardened Marine was offered the post of escorting fallen Leathernecks on their final ride home for burial. More than two dozen times he accompanied the bodies of dead, black Marines to their final resting place. “One time I took a fallen white Marine home to Wilksborough, Pa. (outside Philadelphia). He had the same name as the black Marine I was supposed to be escorting. We didn’t realize the error until the casket was opened, just before the service, at the funeral home,” he said. “The family was devastated –‘Where was their son?’ I had to get on the horn and find out. The funeral was delayed until we got the right body. That was the only bad instance I had while delivering bodies to their relatives,” Taylor said. After nine years in the Corps, he got out of the service and went to work for the Philadelphia Transit Co. He drove trains, trolleys and buses for the city for 17 years until he sustained a work place injury and was forced to retire. He and his wife, Jean, moved to this area from Philadelphia in 1995. They have three grown children: Joe, Stacy and Andre. This story was first printed in the Charlotte Sun newspaper, Port Charlotte, Florida on Thursday, Nov. 11, 2010 and is republished with permission. We don’t mind your using images yet request you adequately credit http://www.DonMooresWarTales.com. Please let us know when your documentary is airing.